Autonomous Actions on the Intelligent Edge. Powerful low-cost edge controllers using open source software are changing the industry landscape. Intelligent Edge Computing changes machine learning's location bringing more power with an autonomous personality even closer to the edge while providing the foundation for a decentralized architecture creating machine distributed collaboration. The joke in our industry is that we are either moving towards or away from centralization. The latest trend sees us moving our present cloud power to the edge driven by low cost extremely powerful controllers capable of a decentralized collaboration. Although this embodies a lot of new concepts it is not that different than the microprocessor revolution of the early 1980s when the power of mainframe and mini was pushed to stand alone controllers. From our lead article, Your Buildings’ 21st Century Edge "What are the takeaway lessons here regarding how edge analytics controllers will disrupt the current building industry?" Looking at what is happening in edge control and analytics in cars is a good way to understand how comparable technology will bring buildings into line with 21st Century service demands. We see, for example, that new edge controllers – those that support the full software stack needed to collect, store and run analytics on time-series data from a building’s many digitized sources – are going to be a powerful force in building automation. We will follow the autonomous car's development of extremely powerful edge implementations to achieve autonomous interaction for our industry. Simple pattern recognition and response (“Look, a dog!”) are handled locally by the autonomous car. In our industry learned actions such as "there is no one in the room," "client arrived at 8:30 am yesterday," ''client has just returned from jog" etc. and other learned actions would be turned into autonomous actions. Back then, I advocated for enterprise energy monitoring and building control in the low-lying cumulus clouds. Today, I would look to managing energy and service delivery in local autonomous systems. These autonomous systems are the fog. Fog offers thinly disbursed nodes of intelligent actors. The software stack is available free on GitHub to put onto a small form factor computer and create your very own “edge device”. For the building and HVAC space, the platform speaks BACnet and MODBUS. 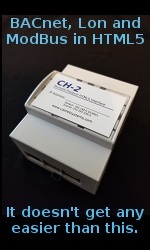 Out of the box and on a mini pc it can be used as a data collection device. True open source communities have been relatively rare in the building automation industry; Haystack and Sedona are the two others that immediately come to mind. It is our hope that VOLTTRON can become a robust and well supported platform with an active community of individuals and organizations dedicated to further development. Secure and open access to data is fundamental in realizing the future potential of the building automation industry. With IoT Edge, Microsoft now makes it easier for developers to move some of their computing needs to these devices. IoT Edge can run on Windows and Linux and on devices as small as a Raspberry Pi with only 128MB of memory. The Microsoft services that can run on these devices include Azure Machine Learning, Stream Analytics (which came to Edge devices earlier this year), Azure Functions, Microsoft’s AI services and the Azure IoT Hub. The end of last week Intel launched Deep Learning on a USB Stick This ultra-low power VPU enables you to add visual intelligence and machine learning capabilities in battery-powered products such as autonomous drones, or intelligent security cameras—at the edge, without a connection to the network, or the need for a cloud backend for your machine learning application. This leap from cloud to tiny edge devices literally "Opens our World" but how to manage machine distributed collaboration? Blockchain has the potential to provide the foundation for a decentralized architecture that would allow permissioning of data to proper stakeholders in the ecosystem their associated with, enabling devices to work together autonomously, without humans. I am watching closely a new CC project, IOTA, which is based on Tangle. Tangle uses directed asymmetric graphs instead of blockchain. Tangle supports forking a database, to rejoin later, which might be critical in IoT applications that may lose connections to the cloud. IOTA can operate without the cloud if an isolated market is desired. IOTA has been demonstrated running on devices as small as a Raspberry PI. In this new autonomous Machine Economy IOTA will be the backbone. The Tangle ledger is able to settle transactions with zero fees so devices can trade exact amounts of resources on-demand, as well as store data from sensors and dataloggers securely and verified on the ledger. The swarmed data collected and analyzed plus the learned actions are the feedstock for training machine-learning. It is a new world where powerful edge devices will learn what they need to know by simply being present and respond with learned actions while sharing their knowledge in a swarm like distributed collaboration. We will start with small victories but you will be amazed how fast this will happen like horses to cars, but the change to autonomous things will occur even faster. The autonomous things will provide seamless interaction learning our wishes. In the beginning, we will express ourselves with data input, but quickly more autonomous devices pushed to the new ever evolving edge will turn our feelings into data for machine distributed collaboration. Machine learning and artificial intelligence are not common in today’s building automation systems. Some systems have features built into their software that represent the beginnings of this technology, but none have been able to capture the true benefits that Autonomous Actions on the Edge will. New-found visibility and context turns what was once darkness and noise, into easily digestible and manageable chunks of actionable information which now occurs autonomously on the edge. We are presently working on cool thoughts for our education sessions for AHRExpo January 2018 Chicago. The Future of Building Automation - "Growing Autonomous from the Intelligent Edge"
Be sure to join us and share your thoughts with us on this exciting topic. As always this new issue is an amazing collection of great articles, columns, reviews, new products, interviews and of course the steady stream of news depicting our rapid evolution and journey to "Autonomous Actions on the Edge." Tell all our sponsors you saw their ads on the AutomatedBuildings.com web-site and thank them for supporting your free access to evolving Automated Building Industry information. Click on their ads and view their valuable products and services. Please review all Our Sponsors. As always lots of new products, plus be sure to check our event calendar to see the number of events we have in our future.